Time attendance is a basic HR process affecting everyone and critical as a basic input to payroll processing. HR faces problems of integrating attendance inputs from different attendance logging systems e.g. cards, biometric scanners and manual attendance registers across all business locations. Each month a lot of HR time is spent collecting and reconciling attendance data before payroll can be correctly processed. Traditional styles of attendance management include hand-written signatures, card bell, magnetic card, IC card and RF card attendance machines. These styles cannot avoid replacer checking out just because that people can be separated from cards. While the move towards the digital era is being accelerated every hour, biometrics technologies have begun to affect people’s daily life more and more. Biometrics technologies verify identity through characteristics such as fingerprints, faces, irises, retinal patterns, palm prints, voice, hand-written signatures, and so on. These techniques, which use physical data, are receiving attention as a personal authentication method that is more convenient than conventional methods such as a password or ID cards. Biometric personal authentication uses data taken from measurements. Such data is unique to the individual and remains so throughout one’s life. A digital image of one person’s fingerprint to be verified is captured; a feature extracting algorithm is carried out; minutiae are extracted and stored as a template for verifying later; people to be verified place his finger on the fingerprint sensor so as to extracting the minutiae from the captured image; a matching algorithm is applied to matches the minutiae with the stored template previously. 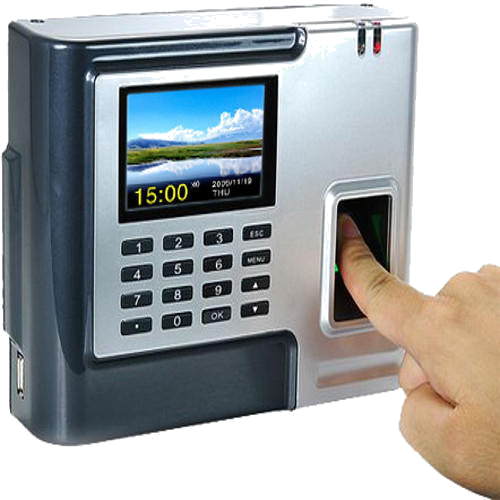 DIGITEK’s Biometric Attendance Management System is complete Biometrics Fingerprint recognition based System which offers a wide range of salient features packaged for the organizations. It gives you the ability to collect data from multiple sources and track your employees' time and attendance automatically as per the company rules and policies. Attendance software communicates with attendance devices to fetch employee punches from the device and calculate daily attendance based on day basis or work hour basis. It also calculates total work time, overtime, late in, early out for each employee in accordance with the rules that apply to an employee or a group of employees. It automates the management of attendance of employees in real-time helps department to track the attendance status and eliminate the paperwork and manual processes associated with time, attendance verification needs. It is new style-of-art software to record attendance based on biometric finger/card recognition. Manage the attendance of all the on-roll and off-roll employees who are currently serving for the department. There will be feature in the software by which user can mark their attendance in fix or handheld attendance machine. When user punch his/her attendance in handheld machine at remote area, attendance will automatically sync with the server through GPRS. Administrator can generate different notices regarding employee’s attendance. Making the system live for all departments/zones.